Quotes can be used as part of a testimonial. First and last words of the paragraph are wrapped in the span elements. They determine whether quotes are facing up or down. First span element has 2em padding on the left and the second span element has 2em padding on the right. The size of the quote image is relative to the size of text. A version of the quote without the pink keyline is shown on the career advice pages. We use block quotes on the site in course content and on our pages when quoting from a text, speech, script or transcript. 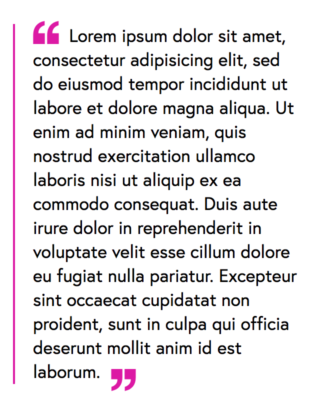 The width of the hairline is 2px and in FL Pink, with the quote padding at 20px.